The author is an agricultural writer based in Northfield, Minn.
Andy Stock believes many farmers could do a better job of planning the long-term future of their businesses. Stock, the owner of Stock Hay & Grain, was fortunate that, before his parents died unexpectedly in 2006, they laid out a plan that enabled their children to keep the farm in the family. Andy was 27 years old then and farming with his dad. Wayne and Sharmon Stock were murdered in their home on Easter Sunday that year. The homicides of the well-liked and prosperous couple shocked the small community of Murdock, Neb., 40 miles southwest of Omaha. Two Wisconsin teenagers pleaded guilty to killing the couple and were given life sentences. “Take time to openly communicate your estate plans to heirs,” advised Andy Stock. Pictured here are Cassy (wife) and Andy along with their children Hailey and Elliott. Stock recalled his dad as an excellent mentor and a patient man. “I know of some operations where the dads don’t want to give up control of anything to the next generation, even though their adult children might be in their 40s or 50s,” he said. Ironically, a few months before his dad’s death, Stock asked his dad if he had a transition plan in place. The younger Stock was prompted to ask the question because of a weekend seminar he had recently attended through the Nebraska LEAD Program. Offered by the University of Nebraska-Lincoln, the two-year program teaches Nebraskans to advocate for agriculture through seminars on policy, marketing, economics, and technology. 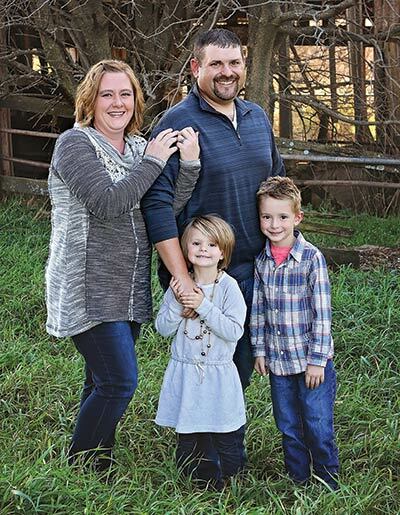 After the tragedy, Andy, along with his sister, Tammy Vance, and brother, Steve, were committed to continuing their parents’ legacy of farming. Then, as now, the farm consists of 1,300 acres of nonirrigated alfalfa, alfalfa-grass mixtures, corn, and soybeans. The acres, which are a combination of owned and rented, are split evenly between the two-row crops and forages. Following the instructions of their parents’ will, which was written when Andy was 5 years old, all assets were put into a trust and were to be divided evenly between the three siblings once Andy turned 30 years old. Control of the farm was given to a local attorney and banker, whom the elder Stocks trusted very much. After the trust expired, Andy and his siblings were free to do as they wished with the farm. With the support of his brother and sister, Stock and his wife, Cassy, were committed to owning and operating it. The young couple also knew it was a great place to raise their son, Elliott, and daughter, Hailey. Over time, the Stock children negotiated a price for the farmland, buildings, and machinery via several meetings. They hired a consultant to aid the negotiations and to keep things amicable. Healthy crop prices from 2006 to 2015 helped Stock, too. “Things might look a whole lot different if I’d bought the farm within the past two years,” he noted. Stock puts up dairy-quality hay in 3- by 4- by 8-foot bales and ships it to customers in Indiana, Ohio, Mississippi, and Wisconsin. Much of it is delivered to customers as needed. He shoots for a relative feed value (RFV) of 150 to 200, depending on which customer it’s going to. “A lot of the dairy producers I work with don’t require quite as high of test numbers as they used to, and they don’t request relative forage quality (RFQ) numbers,” Stock said. Some of his dairy clients also buy his lower-quality hay for dry cows and heifers. The balance is sold in round bales to local beef producers. His yields average 5 tons per acre, and repeat customers buy around 90 percent of his production each year. “Just about everything I produce is already sold as it’s coming off the field,” Stock said. The alfalfa producer keeps detailed records and knows on a weekly basis which customer(s) need hay. “I try to make purchasing it as easy as I can for them,” Stock said. This article appeared in the February 2018 issue of Hay & Forage Grower on pages 14 and 15.